If you're looking for the perfect holiday, then Genting Highlands should be your destination of choice this year. Considered to be the sin city of the east, Genting Highlands is the perfect gambling destination and the best part is, it is the only legal one in Malaysia. But, not to worry, it is also filled with several activities for family and children, which means gambling isn't the only thing people come here for. Genting Highland prides itself as a "mini" Las Vegas and also as an entertainment destination. While being the only legal gambling spot in Malaysia, it is also well-known for the many attractions that it offers for children and family. 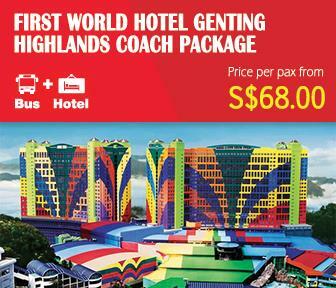 There are more than 6 Genting Highlands hotel and visitors get to choose from an option of over 10,000 rooms. Other attractions include shows, entertainment venues, 170 dining and shopping locations and over 50 fun rides for children. Even the weather is generally pleasant owing to the high altitude positioning of Genting Highlands. Temperature fluctuates between 15 to 25 degree Celsius, with the lowest ever recorded temperature being 10 degree Celsius. Of the 19.2 million visitors who come here every year, quite a few of them come specially for the weather. In fact. there are frequent coach to Genting Highlands from different cities in Malaysia. getting around Genting Highlands is also quite easy as all the spots and venues are connected through escalators, link-ways, and tunnels. Plus, there are sign boards everywhere, to make sure you never get lost. Coming to the main part, Genting Highlands is the Casino capital of Malaysia. The casinos here are open 24 hours a day and serve everyone with the exception of Muslims and individuals below the age of 21. Some casinos also enforce a dress code, but, exceptions are occasionally made. Common games include Baccarat, Poker, Roulette and other Chinese games such as pai gow and tai sai. Slot machines are also on offer, however, you will have to sign up with the Genting Highlands WorldCard program to access them. Famous casinos include the StarWorld Casino, Monte Carlo Casino and the Hollywood Casino. As for family and children"s entertainment, you have several options including First World Indoor Theme Park, Arena of Stars, First World Cineplex, Genting International Convention Center, Genting Outdoor Theme Park and so on.